At a recent meeting held in Fairbairn Hall, Greenlaw, a new strategic approach was agreed to restore the building to full usefulness. The meeting was attended by over 60 residents, as well as representatives from Scottish Historic Buildings Trust (SHBT), owners of the building, Greenlaw Town Hall Management Association (GTHMA), and Greenlaw and Hume Community Council. The building has been under-occupied since it was opened by HRH Prince Charles in May 2011, after a £1.9m renovation project. After a lively discussion, an overwhelming majority of those present supported the proposal for a partnership approach, which would see a scheme of major repairs assessed and undertaken in parallel with the reconfiguration of the building, which would involve office accommodation being converted into toilet, catering and reception facilities. The business plan for the building would essentially be for use as a performance and concert venue, with a secondary revenue stream in weddings and social functions. Room would remain for commercial office letting, and for a wide range of community activities, but the overall objective was to make the building financially self-sustainable in the longer term. Parties would be working together to agree a plan to secure necessary funding, and a meeting to launch that effort will be held on Friday, February 12. 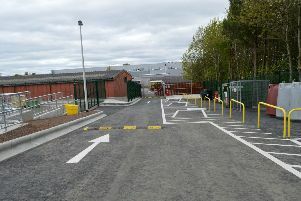 The project would be managed from Greenlaw with local tradesmen strongly encouraged as before, to contribute to the design and planning phase, and to tender for the various work packages. A spokesman said that the project was an opportunity in the short term to create employment, and convert the building from a dilapidated “white elephant” into a valuable community asset. In the longer term however, if the building were to successfully deliver on this business plan, the economic stimulus for Greenlaw residents and businesses would be even more significant, with the prospect of new business opportunities being created. It will be critically important for the success of those fund raising efforts, that it could be demonstrated to funders, that the vast majority of the community in Greenlaw and surrounding areas were fully supportive of the proposals. Comments and feedback in this respect can be sent by email to greenlawhumecc@gmail.com, or in writing to the Community Office in Greenlaw Town Hall. SHBT agreed to an extension of the rent free lease terms for the Community Office, until June 30. Donations towards the running costs of the office are invited, and of any unwanted IT or office equipment are very welcome (to find out more, phone 01361 810334).